I'll be honest and admit that the only Longchamp bag that appeals to me is the Le Pliage. Who hasn't bought one? It weighs next to nothing but strong enough to hold a ridiculous amount of stuff. It folds down to the size of a clutch. I always store the travel sized tote in the pocket of my suitcase just in case I've bought too much on a trip. The shopper sized shoulder bag is the right size for an overnight trip or just lugging grocery home. What I've always wanted was a Le Pliage bag that has an additional strap for the times when I need to be hands-free. I'm glad the company has finally decided to include that vital accessory in the leather version. The price point is very attractive. £285 for the small tote with strap. It's actually a very decent size and far from small measuring 25cm (9.8") height x 42cm (16.5") width and 14cm (5.5") depth. I haven't been tempted to buy a bag for the longest time but in this case, resistance is futile. I have about 4 large foldable shoppers(the travel size) and they are great but have since recently found Bric's to do a better version with adjustable straps. Thanks for the post hun,brilliant as always. I can't wait to see these bags up close. I wish Lonchamp will put reinforced leather onto the corners. Mine wear out so fast. My Le Pliage was my first ever "designer bag". Now I discovered this leather version a while ago and fell in love. I think it`s perfect. Right now I do not have that spare money lying around, but it`s on my wishlist for the long-run. I can see myself upgrading to this bag. I just wonder how durable this leather is, since the classic Le Pliage tends to get ruined corners quite quickly. I heard that the planetes versions are better.. I know what you mean about the corners. My large shopper has holes in all 4 corners. I've read on extrapetite that Longchamp will actually repair them but other than stitching them up, I don't know any other ways of doing so. I have to admit that i knew nothing about Longchamp before i entered the blogsphere (that's just how knowledgeable i was about fashion). Up to these days i still dont know much about it except that i hear its name popping here and there on many blogs. The style and design you have sounds like a dream bag that fits everything and anything. 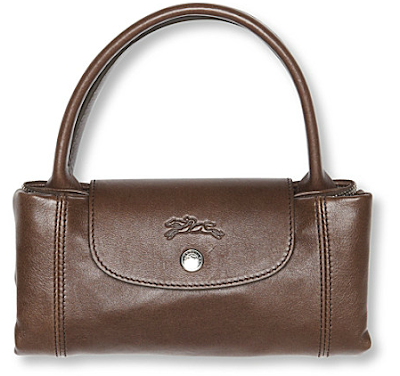 As a Longchamp devotee through and through, this is a must-have for me! Of course, I'll drive you crazy with talk of what color to get! Talk away! I'm loving it more and more. I'm hoping to check the range out sometime next month. oh...i like the all leather -- i didn't know that it existed! My only longchamp is the planates version that doesn't fold up, but is a little more substantial in material than the le pliage. it is very dirty now though, i am afraid. I recently purchased the shoulder tote of the le pilage cuir in cyclamen. I LOVE it. It fits everything and is still lightweight. I am thinking of getting another one for the fall. Great bag. 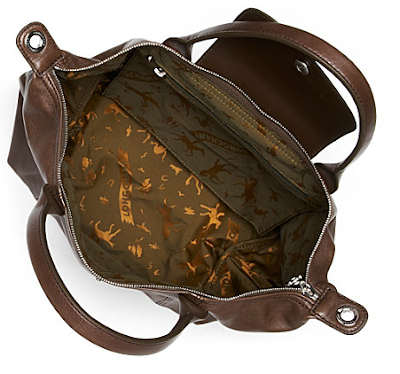 ooh and it has an inside zippered pocket which i always wanted in the nylon version. Not seen a leather version before. Nice. 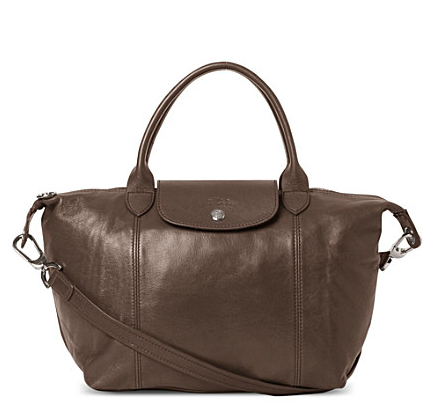 I'm a fan of Longchamp - I think they have really upped their game lately. This one you have picked is definitely a winner ! I've been a fan of the Langchamp bag after Kate Middleton made it uber fashionable. I bought a large one a few years ago for weekend travel and love it! I can pack a load of stuff in it. Ooh, this is the first time I've seen an all-leather version of the bag - I wonder how well that leather will stand to possible folding and refolding. But if it is anything like the rest of their bags, should be pretty awesome! I always ended up buying Pliage for others, mom, sisters, bestie.. but never for myself. I kind of like this leather version especially in the bright colors I saw on the website. A large one for travelling wouldn't hurt :) What about quality? Worth the price? I'm going to check them out sometime this weekend and report back. I saw these too online! I have been really curious about them and like you said, the price point is not bad. They kind of remind me of a Bolide...and btw, you need to get another Kelly in your life! 32 32 32 :) I am so jealous of your 28! A girl needs both! Marlene, which colour are you thinking of? So far I have been happy with mine except for some very faint water marks it has gotten. But I intend to water proof it and see if it will help in the future. A foldable & leather tote?? It's like the best of both worlds! It's great. The strap could really come in handy. I like the soft leather. I agree with you- the Le Pliage is the only Longchamp that appeals to me. I use them for the gym, travel and to the market. Right now i'm having drama because I want to replace my favorite one, but the color is no longer available. wow so they're coming with leather version now!? this is cool!! i've been wanting this!!! i love longchamp le pliage specially the smaller sizes.. they're just so easy to handle! I love this leather version! I use the Le Pliage for school and travel. They last forever. I just purchased a new black one last fall after having my old one for almost ten years. I'm so impressed that the leather version is foldable! Don't you hate it when that happens??! Or the bag is too deep and you end up digging around desperately for the wallet at the checkout counter. I only recently got one as a gift from my boyfriend's mum who is French; must say I really love it and have been eyeing a few other colours! I love the leather version, a strong contender for the Jeremy Scott ones I had my eye on....!